Paperback | 176 pages | Ray Comfort & Allen Atzbi | Take a sneak peek inside. This adaptation of the bestselling book The Way of the Master has been written for today's youth—its timeless biblical truths presented in a fresh way. In this book you won't find a boring lecture; you'll be inspired, equipped, and challenged. What you read will make you want to cry and shout . . . and win the lost. 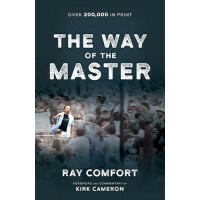 Based on the biblical principles taught in the award-winning TV show "Way of the Master," cohosted by Ray Comfort, this book will show you how to seek and save the lost, the way Jesus did. Each chapter includes a Small Group Study Guide with thought-provoking questions as well as interactive activities, making this ideal for youth groups, homeschoolers, and personal devotions."